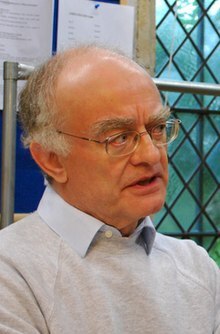 John Rutter (born London 24 September 1945) is an English composer and choral conductor. He has composed a lot of church music. Many of his anthems and songs are very popular indeed with church choirs as well as choral societies. He writes in a style that can be enjoyed easily, and at the same time it is excellent music. Rutter was born in London. He went to school at Highgate School. Another pupil in the school was John Tavener who was also to become a famous composer, although his style of music is very different. Rutter studied music at Clare College, Cambridge. He became director of music at Clare College in 1975 and made the choir internationally famous. In 1974, Rutter visited the United States where he conducted his new cantata "Gloria" which became a great favourite. He also conducted his "Eight Childhood Lyrics". In 1981 Rutter started a choir of his own, the Cambridge Singers. He still conducts them. They have made many recordings. Rutter still lives near Cambridge and spends his time composing and conducting all over the world. Rutter has been given many honours, including honorary Fellow of Westminster Choir College, Princeton (1980), Fellow of the Guild of Church Musicians (1988). In 1996 the Archbishop of Canterbury gave him the Lambeth Doctorate of Music to celebrate all he has done for church music. He was made a CBE in 2007. Rutter also works as an arranger and editor. His collection of Carols for Choirs which he prepared together with Sir David Willcocks is extremely widely used in Britain. Rutter's compositions include Christmas carols, anthems and longer choral works such as a Gloria, a Magnificat, and a Requiem. In 2002 his setting of Psalm 150, written for the Queen's Golden Jubilee, was performed at the thanksgiving service in St Paul's Cathedral, London. He has also written an opera for young people called Bang!. His Mass for Children was first performed in 2003 in the Carnegie Hall, New York. Most of his songs and anthems were written at first with piano or organ accompaniment, but he has also arranged many of them for orchestral accompaniment as well. This page was last changed on 23 November 2015, at 16:55.